Ski passes cannot be legally sold for profit. Here's how to grab a good deal instead. It's been one of the best ski seasons in Colorado in recent memory, but all good things must come to an end. With many ski areas nearing their closing dates, people who overbought early in the season are now trying to recoup their losses by selling lift tickets and passes online. There have been numerous postings on sites like Craigslist in recent days. 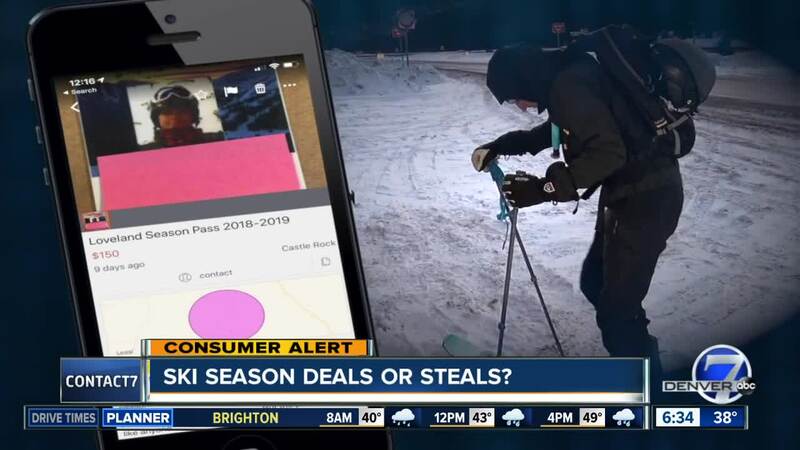 "We always caution folks against looking for tickets on Craigslist," said Colorado Ski Country USA spokesperson Chris Linsmayer. "You never know if you’re getting scammed, or what type of product you’re going to be buying." Some postings seem innocent enough, like people selling remaining tickets from a Loveland Ski Area 4 pack at a discounted rate. While Loveland's 4 packs are well known for being "unrestricted," that only applies to the buyer. That person can use them over multiple days, or share them with a group, but it's clearly printed on the tickets that it's illegal to resell them. Colorado law considers the resale of a lift ticket a form of theft. The law states "any unauthorized person who, with the intent to profit therefrom, resells or offers to resell any ticket, pass, badge, pin, coupon or other device... commits a class 2 petty offense." A buyer or seller could face fines or be banned from a ski area. If you don't want to risk the consequences, there are other ways to get some late season ski deals . Ski Cooper near Leadville will offer $25 day passes from April 1-7. Wolf Creek Ski Area is offering $50 day passes to college students on April 6. Resorts are also holding special events like free concerts in April and starting to sell off gear from the 2018-2019 season. And if you're already planning for next year, now is the time to find deals. Loveland Ski Area 2019-2020 season passes will go on sale April 8 and include the remainder of this season.